Aleksandra is a 1st year BSc Business Management student. She chose to study at Cass for the range of disciplines the course covers. I completed the International Baccalaureate Diploma with Higher Level Economics, Geography, English Literature and Polish, and I’ve been working on the sets of Polish TV series and films. I decided to apply to City, University of London because it was the only university in London that offered a range of very profiled and specified Business majors. I have very interdisciplinary interests and I thought that exploring business from every direction in the first year on a general course is an amazing opportunity. 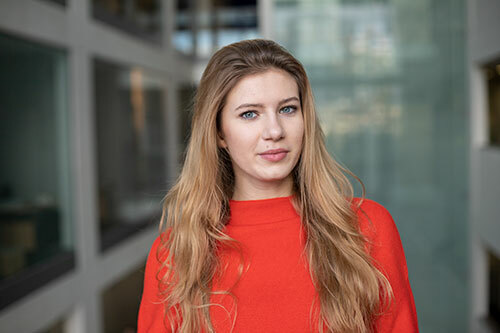 The BSc Business with Marketing degree attracted my attention as Cass Business School is one of the few universities in the UK that offered this combination. The University is located within the heart of London, at the gateway to one of the world’s most dynamic finance and commercial centers, which creates phenomenal opportunities for students, which I experience it every day. The course I have chosen offers modules that helps me discover business from various perspectives, especially the critical thinking module that allows me to apply the theories, I have learnt in my lectures, into practice. Upon starting university, I have joined the Erasmus Student Network (ESN), the largest student-led non-profit organisation in Europe, that aims to enrich local society with the integration of international students. I have already attended two major conferences, which have given me a broader perspective on the way of finding solutions to creating a fairer environment for students. I actively engage in the projects that ESN organises. I have joined the ESN International Communications Committee as a Video Team member, and I am also working as a Student Ambassador at CityStarters. I am currently working on the start-up related to fingerprints scanners which will hopefully transform into a larger company. In the future I would like to work on marketing strategies in corporations such as Disney or Netflix, which are closely related to my biggest passion: film making. In the long run, I would love to run my own film studio and advertising agency. Be yourself, show your personality and interests and follow your passions.